He collaborated with Aphid Moon on the debut EP release 'AphidEP001' with the track 'Burnout' a full-on spy bonanza. Made On Earth is the project of DJ's Ike & Rex, both involved in the scene for many years. Ike is a Brazilian producer with a unique attraction for deep atmospheric sounds. Rex is a Nano Records Dj who's infectious style make sure he is a regular on the Brazillian circuit. 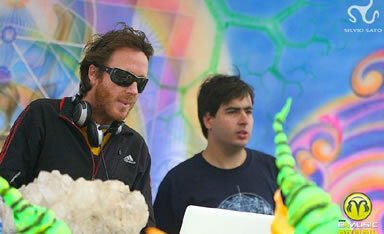 Ike was inspired by psy-trance on a trip to South Africa. On his return to Brazil he met Rex the two hit it off and Made On Earth was born. They have quickly developed their mature sound, having worked with a some top psy producers including Dickster, Aphid Moon and Logica. They have had two collaborative releases with Aphid Moon on Aphid Records 'Jelly on a Plate' an acidic dancefloor wobbler and 'Neblina' an atmospheric psychedelic monster which builds to an epic climax. They have also released on Free Spirit, Mutagen, and are presently working on tracks for south American labels Antu, Solar Tec.